Adwords will be rolling out a new update on their interface by the name of upgraded URL's. These provide an easier and faster way to manage and track important information about each click on your AdWords ads. If we need to make changes in the tracking code then the entire destination URL changes. This triggers a re-review of the destination URL and the ads stop running while your URL is re-reviewed. This wastes time and hampers conversions. 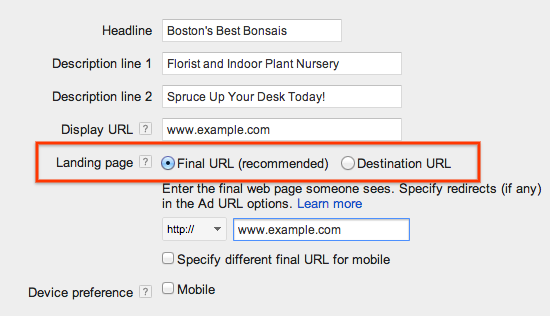 Upgraded URLs let you enter the landing page portion of your URL and your tracking information separately in AdWords. Now, under adwords, you will be specifying 2 different types of information for URL tracking. You can use a shared tracking template at the account, campaign or ad group level. Now, there is no need to change your destination URL's again and again simply because you wish to change the tracking parameters. You only need to change the tracking template and the changes will get reflected across all the ads in the campaigns. This is time saving and scalable. You can use a tracking template at the ad, keyword, or sitelink level.